Ukrainian President Petro Poroshenko and Russian President Vladimir Putin are scheduled to meet on Tuesday in Minsk, Belarus, to discuss a possible political solution to the violent uprisings in eastern Ukraine. Unfortunately, I think the likelihood of success in Minsk– that is, an agreement that brings an end to the fighting and sets the stage for a political settlement with the separatists – is very low. The problem, as was the case with earlier efforts to reach a political settlement, is (1) there is no coherent political leadership on the side of the rebels with which Kyiv can reach a settlement; (2) Poroshenko is politically unable to make significant compromises on sovereignty or to appear to capitulate to Russian pressure; (3) the rebel fighting units are disorganized and any ceasefire agreement is therefore likely to break down very quickly; and (4) the Kremlin has little incentive to end its support for the separatists and bring an end to the uprisings at the moment. Indeed, there is nothing the Kremlin wants that the Ukrainian president can possibly deliver – the Kremlin wants to keep Ukraine in its sphere of influence and out of the European Union and NATO, and it is convinced that the best way to accomplish that is to establish some kind of protectorate in the Donbas, which is something no Ukrainian president can possibly agree to. For the time being, then, the main front in the crisis, so to speak, is the military one, not the political one. Over the past week, the Ukrainian offensive has started to bog down even as the direct involvement of regular Russian military forces has increased. The Ukrainians have made some progress in Luhansk and in the outskirts of Donetsk, but the pace of progress has slowed and Ukrainian losses have been increasing in the face of determined separatist counter offensives. Ukrainian forces that were encircled several weeks ago along the border with Russia seem to have mostly been destroyed, fled across the border into Russia for safety, or been withdrawn. The arrival of the Russian humanitarian convoy in Luhansk, and the evidence of more armor, other military equipment, and fighters in Donetsk indicate that the Ukrainians, despite claims to the contrary, have failed to cut either city off from supply lines from Russia. And the Ukrainians have also failed to take Horlivka or to secure Torez, Snizhne, Yenakyive, and Makiivka, while there is still fierce fighting in the area of Saur Mogila. Most important, however, is evidence that the Kremlin is ratcheting up its slow drip invasion not just by continuing to deliver fighters and equipment to the separatists but by moving artillery and MLRS units across the border into Ukrainian territory, by extending firing sites along the border to the north and south of the conflict zone (see the map), and by firing deeper into Ukrainian territory (there was a report that long-range Russian rockets were hitting Ilovais’k earlier this week). Most analysts are arguing that these measures are intended to strengthen Moscow’s position at the negotiating table on Tuesday. Again, however, it is hard to see how Kyiv and Moscow can reach an agreement at this point. Kyiv is not going to compromise on sovereignty in the east unless Moscow manages to turn the tide of battle and Ukrainian forces start to suffer even worse losses and start to give up territory. That, I believe, is the intent of Russia’s increasingly open involvement in the fighting. Moscow, I believe, is going to keep the military pressure up for as long as it takes to end Ukrainian military advances. 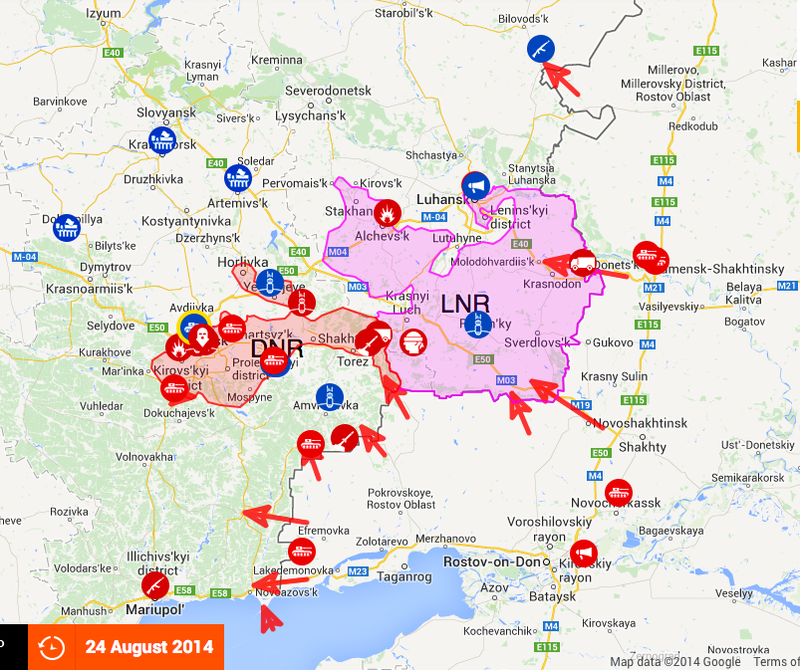 Kyiv’s intent, in contrast, is to take Luhansk and Donetsk and secure the Donbas before winter sets in. Angela Merkel is no doubt making every effort to deescalate the crisis politically, in part for humanitarian reasons, in part in the interest of European security and unity, and in part because she is concerned that Germany’s very weak economy is going to be further undermined by a full-blown trade war with Russia and a gas war over the winter. Unfortunately, however, I think that is where we are headed. ← What happens if Russia does not invade Ukraine?